We will consider applications of current status life tables to nuptiality and breastfeeding. 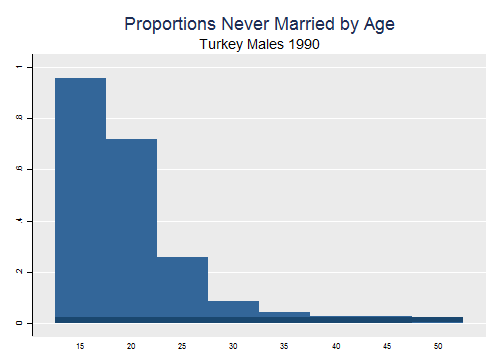 This is the example on page 90 of the textbook, showing proportions single by age for Turkish men in 1990. I start at age 15 rather than 0 because the proportion ever married is zero in the younger age groups. Next I compute the proportion single in each age group, estimate the proportion single at age 50 (s50) as the average of age groups 45-49 and 50-54, and compute SMAM. I add 15 because that's the age at which I started, and multiply s50 by 35 (which is 50 - 15). SMAM is 25 years and corresponds to the lighter area in the figure below scaled by 1 - s50. The darker area shows the proportion that will remain single by age 50. In an earlier handout on smoothing I showed that retrospective reports of duration of breastfeeding in Bangladesh (as elsewhere), show very substantial heaping at multiples of 12 (and to a lesser extent 6) months. We now use a current status life table to obtain more reliable estimates. I extracted data from the Bangladesh WFS for all births in the three years preceding the survey and tabulated the number still breastfeeding and the total number of births by current age and type of place of residence (urban, rural). We will collapse the data by age, effectively summing over place of residence. A slight problem with this "lx" function (shown below) is that it is not monotone. There is an algorithm to force monotonicity known as "pool adjacent violators"; essentially you use the observed proportions as long as they are non increasing, when you find a violation of monotonicity you backtrack, combining adjacent ages, until the problem dissappears, at which you resume working forward. A simpler approach is to use a smoother, and the figure below shows a regression spline. I fitted it used logistic regression to take into account the fact that the underlying data are binary, but otherwise the basic idea is the same as before. I use a regression spline with internal knots at 12 and 24 months. An important point to note is that there is no evidence of precipitous declines in proportions still breastfeeding after 12 or 24 months, so the heaping of retrospective reports on these values was probably bad data rather than a real phenomenon. This is why current status life tables are the method of choice for duration data on breastfeeding, post-partum amenorrhea, and post-partum abstinence, which are usually poorly reported. It is clear that upwards of 90% of all children are breastfed; the exact value is hard to determine because our first data point is at exact age one month, but a direct question suggests it is probably of the order of 95%. or almost 23 months. Using the spline gives 22.8 months. The mean is probably higher, depending on how far the 20% upper tail extends. The incidence-prevalence estimate is 23.8 months, and is consistent with the other results. Children weaned, or who never breastfed, are left censored at their current age (all we know is that they breastfed less than that). Yet we can still estimate a survival distribution!